Finally, Football Peace Cup 2012 has now officially ended. After winning yesterdays last game match against Chinese Taipei, Philippine Azkals team is now celebrating their first ever international football championship. According in a sports related site, Philippine football team has now successfully broke the record in losing the championship in many international game match after 99 years. It says in the report that the last time Philippine football team got a hold on a championship in an international tournament was last 1913, that was when they were claimed as champions at the Far Eastern Games (now called Asian Games). Now that they have bag the victory against Chinese Taipei with a score of 3-1 (w-l) state, Azkals can now rest, wait and practice more for the upcoming game event of 2012 AFF Suzuki Cup this November. The three Azkals member who gave the team the goals are Denis Wolf, Chieffy Caligdong, and OJ Porteria. They scored at the 10th, 34th, and the 43rd minute of the game match. For more of the latest happenings about the game events and schedule of our very own Philippine Football Team, 'Azkals', you may bookmark this page or keep visiting this site more often. I'll be updating this post once an available information is given. If you happen to like this article, you may also share it to your friends on Facebook, Twitter, Google+ and Pinterest so they too may be updated. 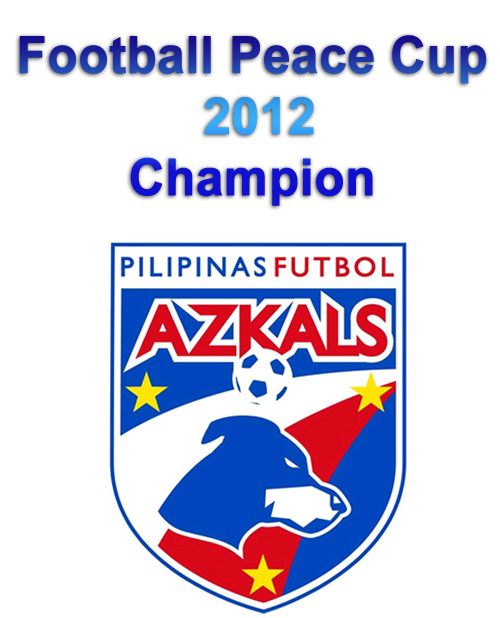 Comments or suggestions about "Philippine Azkals Champion in Football Peace Cup 2012" is important to us, you may share it by using the comment box below.